There’s a new blog in town and I encourage you to check it out. The piece that I did for Sew Steady is featured. There’s also a contest where you can win a free on-line class, hurry check it out. This entry was posted on September 2, 2018, in Applique, Online Class, Quilting, Sew Steady, Westalee. I was asked to submit a 12” square quilted block for the Coburg Quilt Show Block Challenge that was held this past July (2018) in Coburg, OR. Sew Steady was the major sponsor for this show and having recently been invited to be one of their Brand Ambassadors, I jumped in. I love using the Westalee Design Spin-e-Fex templates as pantographs. (aka continuous line designs). The mini size would be perfect, but boring if horizontal. I decided to make the design go from corner to corner and switch up the sizes between 1 ½” and 2 ½”. This involved math; you know that geometry class you took in high school. Initially my plan was to fill in the empty triangle space created with the 1st part of the design with more Spin-e-Fex patterns. Then I looked at the block and thought it would be too busy and the original design, quilted in variegated threads, would get lost. Now I needed a design that would fit in a triangular space and not compete with the beautiful flowery design I had stitched out. Thread that matched the fabric would help and I have templates, Flying Bell Curve Triangles from the London Collection, that are the right shape. I played around with my stitching line discs and before I knew it, I had the solution. I’ve never been to Coburg and have no idea what kind of flowers grow there, let alone know about flowers in general. My block looks like flowers, flowers probably grow in the Pacific Northwest in summertime, so I went with name “Coburg Blooms.” My goal was to create a block that wasn’t super complicated, but still looked good; not win awards. I am happy to report success on both counts. I hope you like it and if you try this block, I would love to hear about your success. I used the Mini Spin-E-Fex #8, but any in the line will work. For the Flying Bell Curve Triangles, I used sizes 2”-5”. Marked my block with an 8pt. Cross Hair Square. The first one I did on cream. Next I tried Orange. Which is your favorite? This entry was posted on August 17, 2018, in Quilting, Sew Steady, Westalee and tagged Sew Steady. This past weekend, I had the honor of attending Teacher Certification training by Leonie and Bill West of Westalee Designs. We all met in Eugene, OR; the home of Sew Steady. I started my education by touring the manufacturing process of Sew Steady Extension Tables and Cabinet inserts. Tables are cut to order and then hand finished, one at a time. The time from order to shipping can take up to 3 weeks, but it is usually less. I loved looking at all those new shiny tables awaiting to be boxed. Next up was the laser cutting of the quilting templates. This amazes me. First there is the computer design file which is magically sent to the laser cutter. Eventually a huge sheet of acrylic becomes a handful of templates. The process is not as quick as I thought even though they manage to get as many templates in one file as possible. Think cutting cookies. Acrylic cannot be rolled up like dough, but I am happy to report that the left overs are recycled. Manufacturing runs 24/7. Even though there are computerized cutters involved, it is still a labor-intensive product. I honestly think the price could be more; especially considering the cost of acrylic. Meeting the staff was a high-light as I talk to these folks on the phone regularly. I love connecting faces to voices. Then of course, there was shopping. It was too tempting seeing all those shelves of ready to go template sets, so yes, I came home with a few……or more. Now it was time for class. Leonie and Bill spent 2 days going through basics to advanced uses for templates and showed us prototypes of soon to be new template sets. We shared our own work, talked about up-coming education for consumers, and brain-stormed for the future. My head kept spinning with the possibilities; both with the product and classes I can offer. Leonie has what I call the perfect mind for designing. She can see a simple shape and imagine endless possibilities. She marries this with the math we learned in Geometry (ok, that may be over simplified) and a template is born. Then she takes it further to see what other designs can be made. It is genius. The possibilities are truly endless. The Whoa! Wait! What? moments kept coming. I am inspired and yet humbled as there were only 5 of us invited. The Wests are truly lovely people with a heart of gold. There a few new tools being released and they took the time to make some with our names engraved on them. That small gesture means sew much to me. Every course requires graduation ceremonies and ours was nothing short of special. My expectation was a paper certificate with my name in a curly font. And then the unexpected happened as I was the first called to the podium. Inside a small cloth bag was a Full-Size Gold Ruler Foot and a Mini 12” Arc Template hanging on a chain. It is the official sign of being an Accredited Teacher. I am now one of 10 in the world that have been accredited by the Wests. With honor comes responsibility and one I will not take lightly. I will continue my online classes; adding new sessions as quickly as I can and look for opportunities to teach in shops around the country. If you want to see my necklace up close and personal, please feel free to contact me. School is back in session; seems like a perfect time to share my love of education. I have always loved the process of learning and I am fortunate to be able to teach. For over a year now, I have been hosting the Quilt as You Go Sampler Quilt designed by Leonie West of Westalee Designs. In this course, students learn Ruler Work on their domestic sewing machines by using 7 different templates. Currently, I am conducting the course on-line. Leonie’s husband, Bill, filmed while she quilted every block. In these videos, she guides the students with her extensive knowledge of the products she invented. The two of them are an amazing team. The brilliance behind their collections of quilting ruler templates is beyond compare. They are so perfectly engineered and paired with their true 1/2″ ruler foot, a quilter will never lack for inspiration. Why do I teach online? Ruler Work requires a flat surface and many quilters have their machines in a cabinet. The bigger machines that so many of us love, are too cumbersome to transport. Then there are those who either don’t live close to a local quilt shop or lack the means to get to one. I provide a place for them to go. When I first started teaching online, I was concerned I wouldn’t be able to connect with my students. There was also the challenge of not being able to “see” when they are heading down the path of bad habits. Monthly live sessions in my virtual classroom, email, digital photography, and social media have all played a role in giving my students the level of education they not only need, but deserve. A little Sassy-ness sprinkled here and there by us all adds to the atmosphere. We are all busy learning. My students anxiously try their new skills and challenge me with questions. I’m exploring ways to improve their experience and experimenting with both stand-alone software and online options for my business. Each new platform requires education. Linking files, adding photos, entering data, oops moving data. Then my obsession with perfectionism kicks in, or I discover a better way to accomplish a task and I start over. The exhilaration of this new knowledge mixed with accomplishment keeps me going. There isn’t much time at the end of the day for me to spend in my studio. Moving forward, I will have to find more ways to fit that in. This mixture of my passion for ruler work, teaching, and technology has taken me on a journey that is filled with excitement at every turn. I receive comments almost daily that confirm I am headed in the right direction. I am hopeful for what the future holds and the never-ending batch of new students the World Wide Web steers in my direction. *Sew Steady is the Distributor and Manufacturer for Westalee Design in the US. This entry was posted on September 7, 2017, in Online Class, Products I Love, Quilting, Sew Steady, Westalee and tagged Quilting. Oh how I love new templates. I am often asked, “What’s your favorite template?” My response is usually, “The last one I got in my mailbox.” But this time I really really mean it. The Flying Bell Curve Triangles are the first of The London Collection designed by Leonie West of Weatalee Designs. Let me tell you, she has really out done herself with these templates. They come in multiple sizes and you can create triangles, rectangles, pantagrpahs, borders and sashing, and too many to list because I know I’d miss some. If that’s not enough, the inside of the template is in itself a template! That’s double the templates. You can use the entire template or just part of it. The gentle curves are amazing on their own, but when you join them mirrored they create ribbons and new designs. Adding to the fun is the Design Inspiration Book by Leonie that you can download. The link is included in the packaging. The designs in this article are from that book. If you don’t follow the instructions exactly, you come up with a totally different, totally awesome look. You literally can’t make a mistake. See the entire collection here. Watch Leonie on Sew Steady’s FB page here. Apply Discount Code PARTY15 when checking out in My Sassy Notions online store to save 15% May 4-9, 2017! This entry was posted on May 2, 2017, in Quilting, Sew Steady, Westalee. So you bought the Westalee Ruler Foot and Sampler Set. Now what do you do? If you can’t find a local class or your machine is in a cabinet that you can’t load in your car, take an online class. 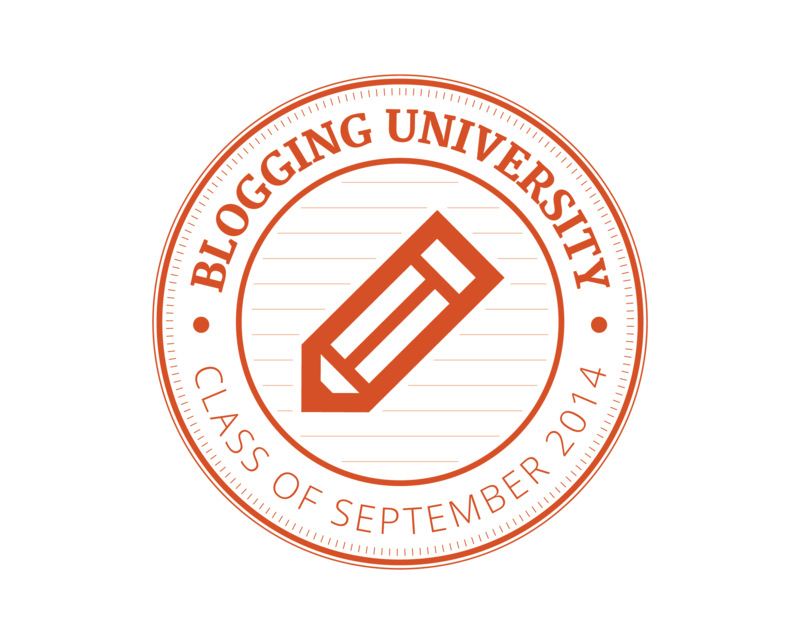 The class we offer is hosted by Pam Varner, Westalee Design Accredited Teacher. Each month you will have the opportunity to attend a Live Webinar which will include videos by Leonie West, Tips from Pam, and Q&A. Learn how to use Stable Tape (the white bumpy stuff). Discover the ways reference lines both on the templates and your quilt, can assist you create beautiful designs. On going email support is available for all students. What you will learn is how to use all the templates in the Sampler Set. Using the reference lines on the templates and on your quilt are explored. In addition to learning the basic shapes, you are shown alternative ways throughout the course to use the templates. The goal is for you to become comfortable using them and build your skills. My intention is for you to take these skills and apply them to your own tops. Click here to for more information and to regiser. Contact us by emailing mysassynotions@gmail.com if you have any questions. I am the luckiest person I know! This past weekend, I had the honor of demoing Westalee Design by Sew Steady® products at the Madison Quilt Show. If that wasn’t enough, I was doing it in Nancy’s Notions’ Booth. I found myself in Southern Wisconsin, not far from where I grew up in Northern Illinois. The trip started shaky, with a 2 hour flight delay, but that proved to be the only hiccup. Let me begin by saying the folks at Nancy’s Notions are some of the best I have every worked with and the customers were too much fun. Bucky Badger (from UW) and the band marched in and gave a performance that literally stopped the show for about 30 minutes. Only in a college town, could a mascot distract a quilter with a shopping bag. We all enjoyed the entertainment. 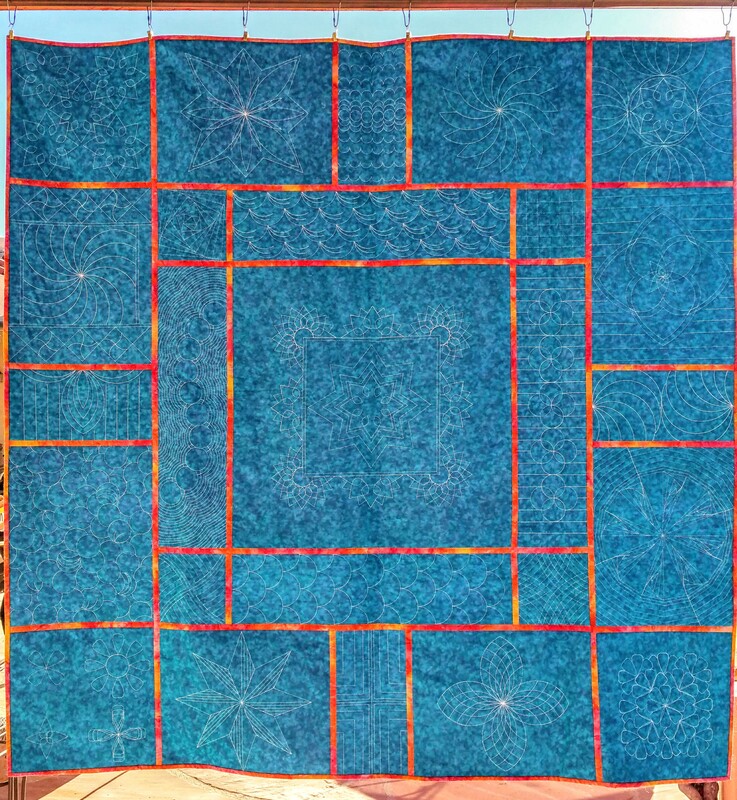 For 3 days, I made quilting magic with the Westalee foot and templates. You can see me in action on Nancy’s Notions’ FB page. It’s the one titled: Enter here for a chance…. The look on customer’s faces at the first sight of this product never gets old. I truly appreciate the opportunity to share the possibilities with fellow fabric lovers. One of my online students stopped by and after the show, we went to dinner. Always fun to meet folks in person that you connected with via the World Wide Web. To top it all off, I had the honor of meeting Nancy Zieman. The respect I have for that woman is off the charts. She is definitely a trailblazer and I can not even count the amount of hours I have sat in front of my TV on a Saturday morning just to watch her. She is literally the reason I sew. I have met my share of celebrities over the years, but meeting Nancy brought tears to my eyes. I am in the industry I am supposed to be in: for that I am extremely grateful. This entry was posted on September 13, 2016, in Quilt Shows, Quilting, Westalee and tagged Quilting, social media. This entry was posted on March 27, 2016, in Online Class, Quilting, Sew Steady, Westalee. is open, I hope to devote more time to YOU! 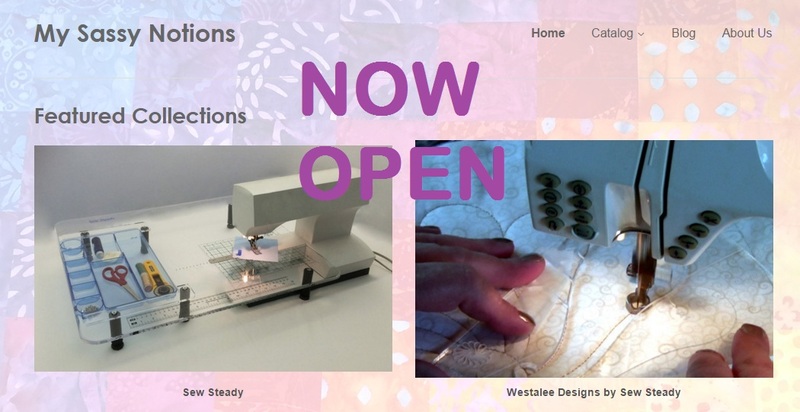 This entry was posted on December 8, 2015, in Notions Notions Notions, Products I Love, Quilting, Sew Steady, Westalee and tagged Quilting, Sew Steady, Westalee.